In just days, we'll start our Eighth Annual Great Tomato Plant Sale, first on March 30th at Our Garden in Walnut Creek, then on April 6 at the Richmond Public Library, and finally on April 13 at Mangini Garden in the County Fairgrounds (Antioch). Between now and then, we're busy potting up over 18,000 seedling tomato plants. This year, we are propagating 92 varieties, the most we have ever offered, including 10 new ones. Not every variety will be at every sale though, so be sure to check the lists of tomato varieties for your local sale, varieties specifically selected for the very different sub-climates in Contra Costa. We continue to introduce, along with several new, unusual heirlooms, a wider selection of very special hybrids that have the disease-resistance some gardeners value, but that also have the great, old-fashioned taste we all treasure in heirloom tomatoes. This year, we’ve once again asked a challenging question of some of the best tomato growers among our UC Master Gardeners. 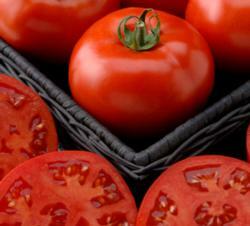 Tell us what your favorite tomato is? Since some of these folks grow 15, 20 or even 30 different tomato varieties in their gardens, you can imagine how this question bedevils them. We’re calling their selections our Hot Tomato Picks. 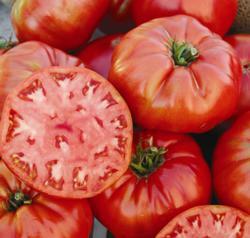 You may want to add a few of these vetted tomato varieties to your shopping list. 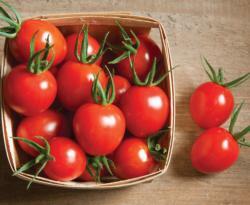 For our final Hot Tomato Picks this week, we’ve picked two wonderful beefsteaks. We’re recommending a true heirloom with a great back story and another very unusual beefsteak. You’ll be oh-so-grateful that you grew them! Mortgage Lifter: (Indeterminate—90 days). Beefsteak. Mortgage Lifter produces 1-2 pound big, red, very flavorful beefsteak tomatoes. Plants are very productive, disease-resistant and long-bearing, right through until frost kills them. You may be able to enjoy them at Thanksgiving! One UC Master Gardener wrote: Just all around perfect tomatoes, no problems, good yield, medium-to-large fruits with that wonderful, old-fashioned tomato taste. 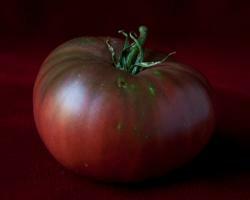 Named for a fictional alien race on TV, this is a stunning purple-black, deeply ribbed and oddly shaped tomato. Where does it come from? But its taste is like none other—rich, smoky and earthy—a taste that led Baker Creek to call it its “best tasting tomato!” Large, one-pound fruits appear mid-season. It should grow well in West County as well as Walnut Creek. UC Master Gardener Liz Rottger wrote: This may be one of the weirdest tomatoes out there. It is so strangely shaped, no wonder it’s named after an alien. While it may look funny, its taste is truly out-of-this-world! Sun Sugar-hybrid: (Indeterminate—62 days). Cherry. This very sweet, fruity-tasting orange cherry grows in long clusters on vigorous plants and is very crack resistant. It may be the sweetest, nicest cherry out there. Its taste is so delightful, they may not make it into the kitchen from the garden. But what is lovelier than a sun-warmed tomato popped directly in your mouth? 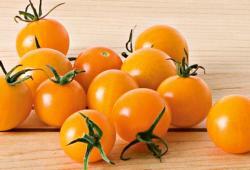 One UC Master Gardener wrote: Produced the most heavenly sweet, orange, little tomatoes I've ever tasted. This tomato produces 40 (!) small, bright red cherry tomatoes on long, cascading trusses. So sweet they won’t even make it to your salad bowl without some self-discipline. One UC Master Gardener wrote: Even in my West County garden, Rapunzel let down her beautiful tresses of bright red cherries all summer long. Cherry Bomb-hybrid: (Indeterminate—70 days). Cherry. How can you resist a tomato with a name like this? We couldn’t! Add to that, it’s recommended for your Bloody Mary, and its strong meaty walls are perfect for filling with cream cheese...yum! But, equally important, it’s blight resistant too. 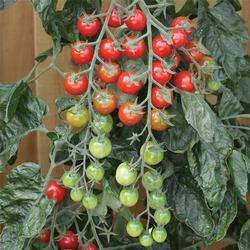 Vigorous plants produce lots of uniform cherries with a sweet cherry tomato flavor. If you plant Cherry Bomb by the end of April, you can serve it at your 4th of July party. One UC Master Gardener wrote: This was such a reliable cherry in my garden. I would miss it if I didn’t grow it again this year. Chef's Choice Pink-hybrid: (Indeterminate—75 days). Beefsteak. A hybrid that is easier to grow than some heirlooms, but just as flavorful. Disease-resistant, rugose-leaved hybrid produces beautiful deep pink, meaty, 12 to 14-ounce fruits with a great old-fashioned tomato taste and early to boot! 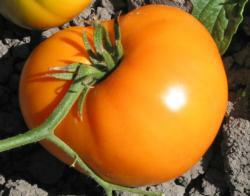 UC Master Gardener Sara Hoyer, a true tomato lover, wrote: I grew Chef’s Choice for the first time last year. No wonder chefs choose it. It was fabulous! Wonderful flavor and super productive! 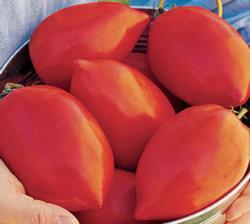 Vigorous and prolific heirloom produces 12-ounce to 2-pound persimmon-colored beefsteak tomatoes. Right at home in the shorter-season gardens of West County. Very meaty with few seeds, this is a low acid tomato. A UC Master Gardener wrote: A beautiful, large beefsteak-type slicer with rose/orange skin and flesh making it real eye candy in a tomato salad. Sweet, rich tomato taste—another taste test winner. Persimmon is an heirloom that is said to have been grown in Thomas Jefferson's garden. Black Sea Man: (Determinate—80 days). Slicer. This hardy Russian heirloom produces dark fruits in 75 days and does well in containers. It does well in both West County and Walnut Creek. One of our UC Master Gardeners wrote: The mahogany brown medium sized fruit has a delicious sweet-tart, complex tomato flavor. 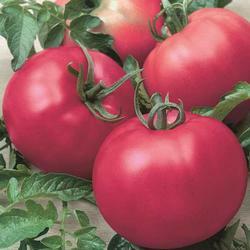 Its combination of red, pink, green, and mahogany flesh makes this a most unusual & beautiful tomato when sliced. It’s a smallish plant, but a very good producer. With a name like Phoenix, naturally it’s heat resistant. Like other determinate tomatoes, it does well in containers. A proven performer in the South, you may want this patio tomato if you live in the warmer areas of the county. We loved it at Our Garden. Its vines produce lots of 8-12 ounce bright red fruits all summer long. Phoenix will be offered exclusively at the Our Garden sale on March 30th. A UC Master Gardener wrote: An amazing tomato that will grow in a large patio pot and produces beautiful, good-sized tomatoes. Phoenix is a great slicer with very good flavor. Big Mama-hybrid: (Indeterminate—80 days). Paste. 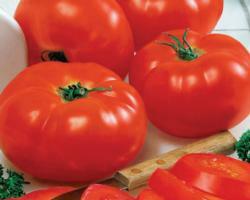 Produces heavy yields of flavor-packed 5” long paste tomatoes that are meaty, easy to peel and have very few seeds. That makes them perfect for sauces, soups and salsa. Mama mia!! UC Master Gardener Janet Miller, a great tomato lover and responsible for all our propagation, has selected this outstanding paste tomato. Here’s her review: I love this Roma tomato and we’re very excited to offer it again this year. It produces an abundance of extra-large fruits that make simply delicious sauces! Big Beef-hybrid: (Indeterminate—73 days). Beefsteak. An unbeatable combination—big, tasty and early! Throughout the entire season, this highly disease-resistant hybrid produces colossal (10-16 ounce), bright red fruits with a rich tomato-ey flavor. It is adaptable to a wide variety of growing conditions, even cool, foggy West County. UC Master Gardener Helen Erikson, a wonderful propagator and responsible for the lovely orchard at Our Garden, has chosen the hybrid Big Beef. Here’s Helen’s review: This tomato had so much fruit, more than I’ve seen on other varieties. I grew it for the first time at home several years ago, and last year we also grew it at Our Garden where it got many comments as to how full it was with fruit. I could always count on Big Beef for a yummy tomato—practically a meal in itself and will now grow this variety every year! Return to the Great Tomato Plant Sale main page.